Bluegiga Technologies, available through Glyn High-Tech Distribution introduces a range of eHealth products for medical, health and fitness applications. The new Continua-compatible products can be used in various health, medical and fitness applications by OEMs and system integrators. Bluegiga eHealth products offer an open standard, easy-to-use platform for building Bluetooth-certified and Continua-compliant wireless sensors and networking them to customer backend systems. According to Mikko Savolainen, Bluegiga's Vice President of Product Management, standard wireless technology in health and medical applications is a fast-growing market. Continua Health Alliance is promoting Bluetooth-based wireless products to enable global manufacturer-independent compliance between different devices. Mr Savolainen adds that Bluegiga’s complete end-to-end solution meets the compliance requirements of Bluetooth Health Device Profile and Continua IEEE standards. Bluegiga's Continua-certified eHealth Gateway for building networks and Bluetooth eHealth modules for sensor end are currently available. eHealth Bluetooth Modules are engineered to support virtually any health, medical or fitness application requirement where Bluetooth wireless technology is needed for data or audio communications. Bluegiga’s OEM modules incorporate the eHealth Bluetooth protocol stack and carefully designed hardware and antenna solution, simplifying customer integration projects while providing maximum connection distance. The eHealth Bluetooth Gateway product family offers simple and efficient network connectivity for Bluetooth-enabled medical, health and fitness devices. Built on a Linux operating system platform, these gateway devices offer flexible operating modes for data routing, application hosting and protocol conversation. Bluegiga eHealth Gateway devices incorporate Bluegiga’s latest generation long range Bluetooth module increasing the range three or four times when compared to other competing Bluetooth gateways. 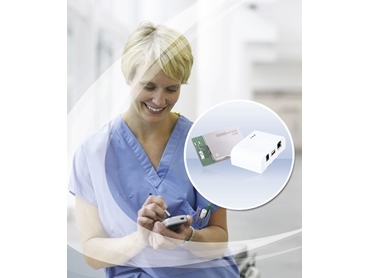 This makes the Bluegiga Bluetooth eHealth Gateway an ideal solution for in-home, clinic or hospital environments. Bluegiga offers an eHealth Gateway SDK for maximum flexibility and application customisation. The eHealth Gateway SDK provides applications source code and other development tools, allowing software developers to extend gateway functionality to fit their unique application and backend system requirements. The eHealth Bluetooth Gateways are available in several product variants that combine multiple Bluetooth radios with 2G/3G, Wi-Fi and Ethernet connectivity in a single, integrated platform. The Bluetooth Gateways are capable of supporting 7-21 simultaneous Bluetooth connections, making them ideal for networking multiple medical or health and fitness devices to backend systems.